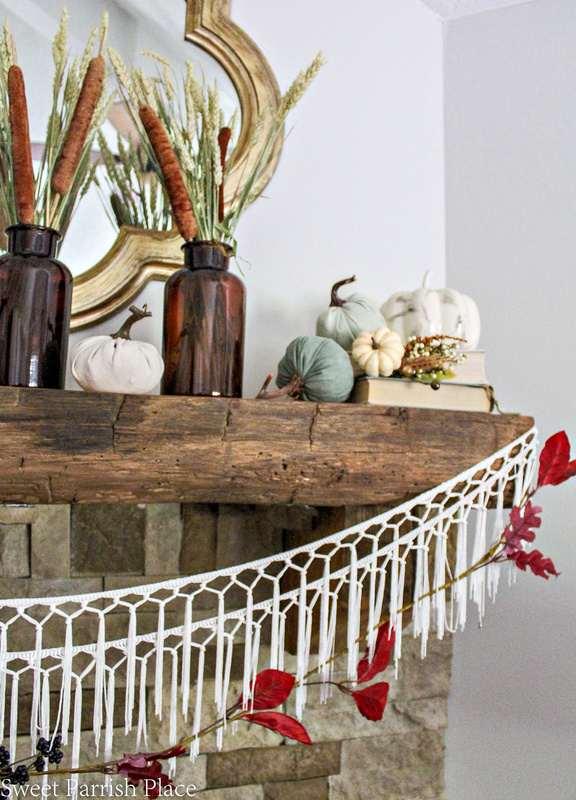 I hope you enjoy this little peek at my Fall Mantle! Hey friends! 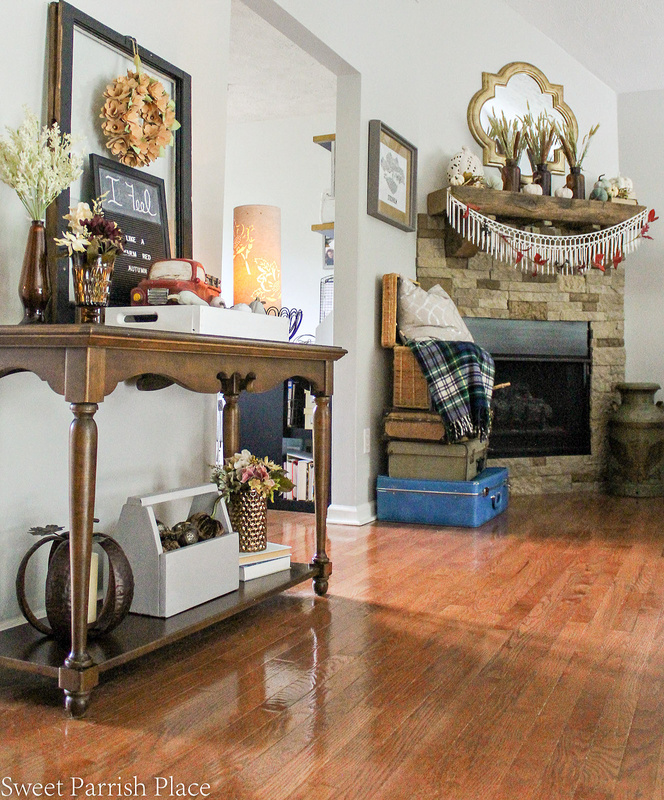 Did you have a chance to check out my Fall Entryway yet? 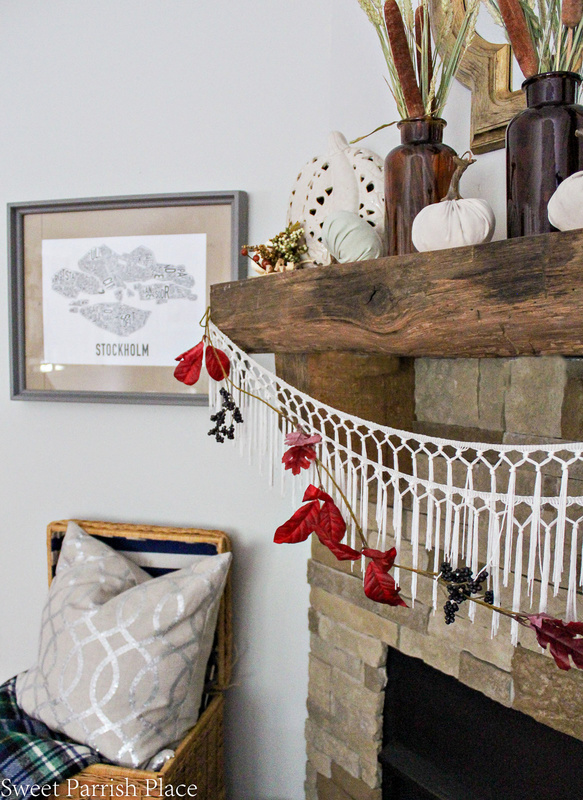 I’m back today with the second part of my fall tour, and this time I’m sharing my fall mantle. 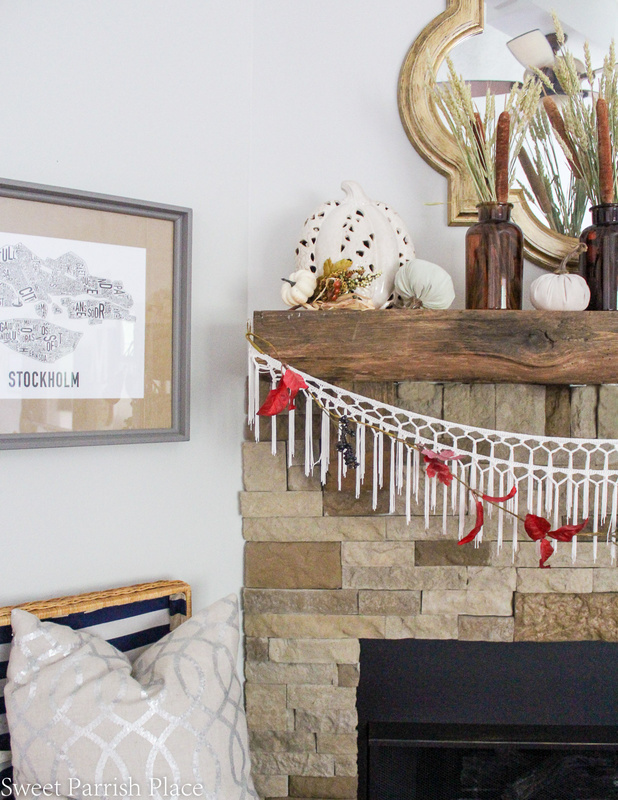 You have no idea how much I love decorating my mantel. Mainly because when we moved into this home, it didn’t exist! And to this day I say it is one of the things that changed the look and feel of our living area the most of all. If you would like to see where we started with the mantle, you can start by check out this post. 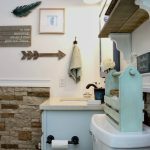 But I am forewarning you, things have changed a lot since then, with my photography and blogging skills to my decorating and styling skills. 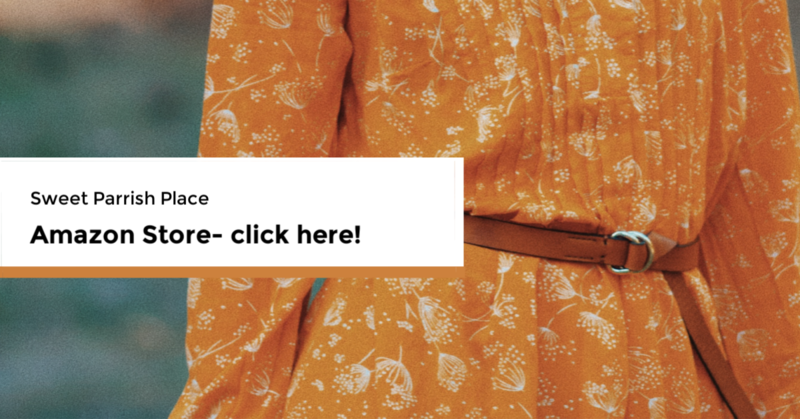 It is looking back on some of my earlier posts that helps me to remember how far I have come in this blogging journey. And boy oh boy, this mantle has come a long way! 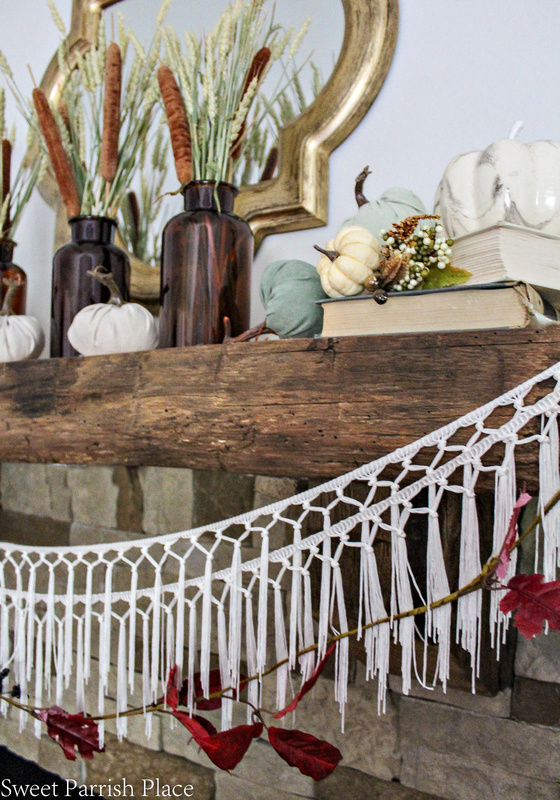 One of my favorite things about my fall mantle is the pretty fringe garland I have hanging there. But that really isn’t exactly new. I added it around Christmas last year, and I can’t bear to part with it because I love it so much. I added this little colorful leaf garland on top of it, and I love the simplicity of it. If you have been reading my blog for awhile, you have seen my little stack of vintage suitcases before. They have been right in this spot for awhile now. The thrifted picnic basket is a newer addition, and the green milk can was in my parents house when I was growing up. My mom tells me she painted this herself. I often think of painting it, but I haven’t gotten around to it just yet. But lets talk about the pretty pom pom throw you see in the photo below. Isn’t it dreamy? I found it at Home Goods several months ago. And truth be told, I have to keep it put away from our dog because he would eat those pom poms right up in a heartbeat if I let him. 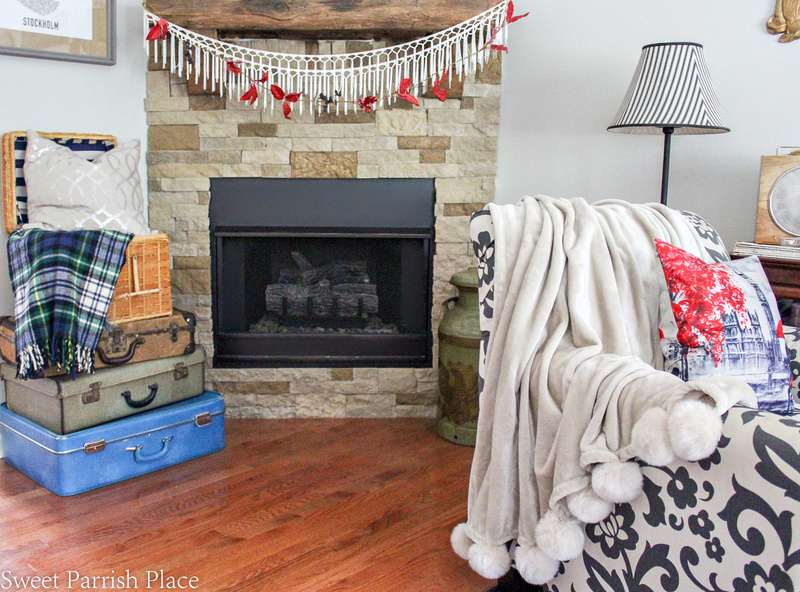 I also love the throw pillow I added to the chair, and you will see more of my fall living room very soon, I promise. I recently moved my Stockholm print over to this wall because I needed to make room for one of my son’s framed senior photos. My daughter bought this for me when she visited Sweden, and you can read all about how I found this thrifted frame and gave it a little makeover. 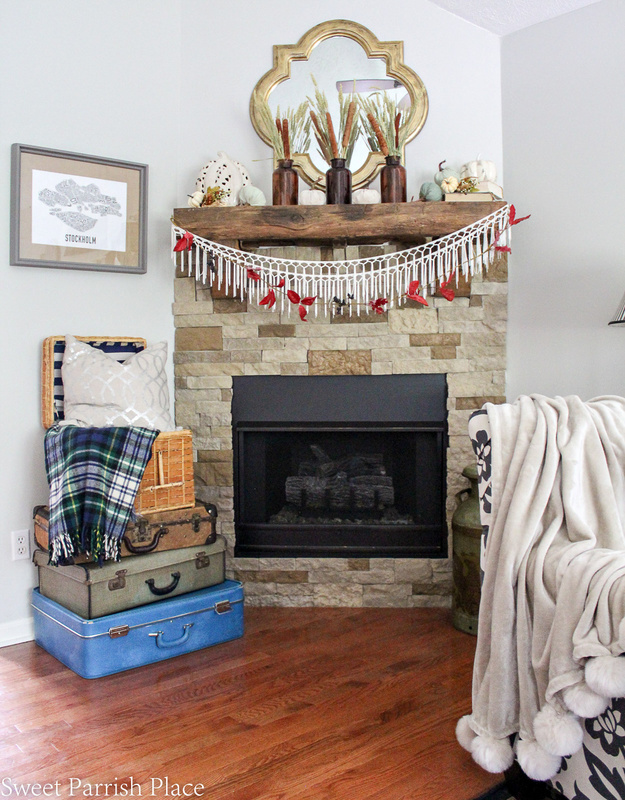 The surround on my mantle was a DIY project the whole family helped with, and you can read all about it here. We used AirStone for the surround. 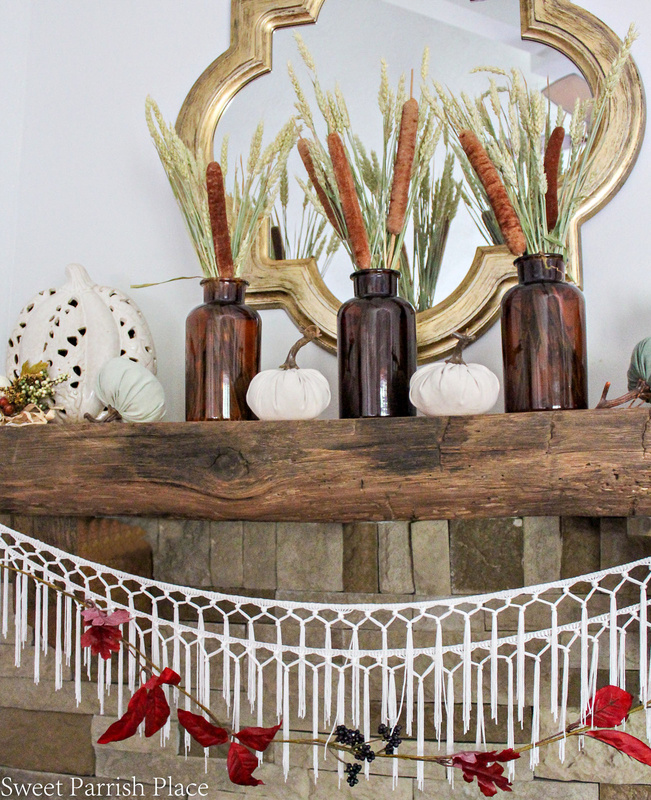 I have had these amber bottles for a couple of years, but I like them the most of all in my fall decor. This year I filled them with some wheat and some cattails. Easy peasy! 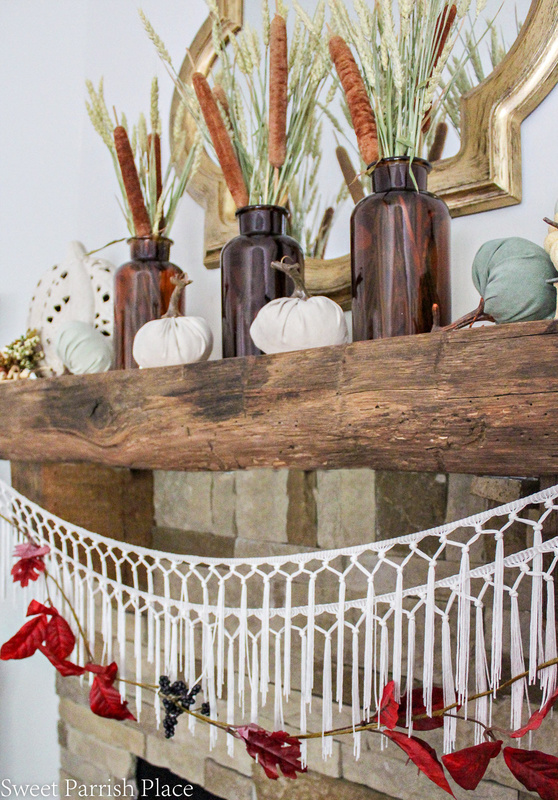 This fall mantel was really just so easy to put together. I scattered some little fabric pumpkins in cream and mossy greens around, along with a couple of larger cream colored pumpkins, one at each end. I stacked a couple of vintage books to give one of the pumpkins a little more height. And that was basically it. 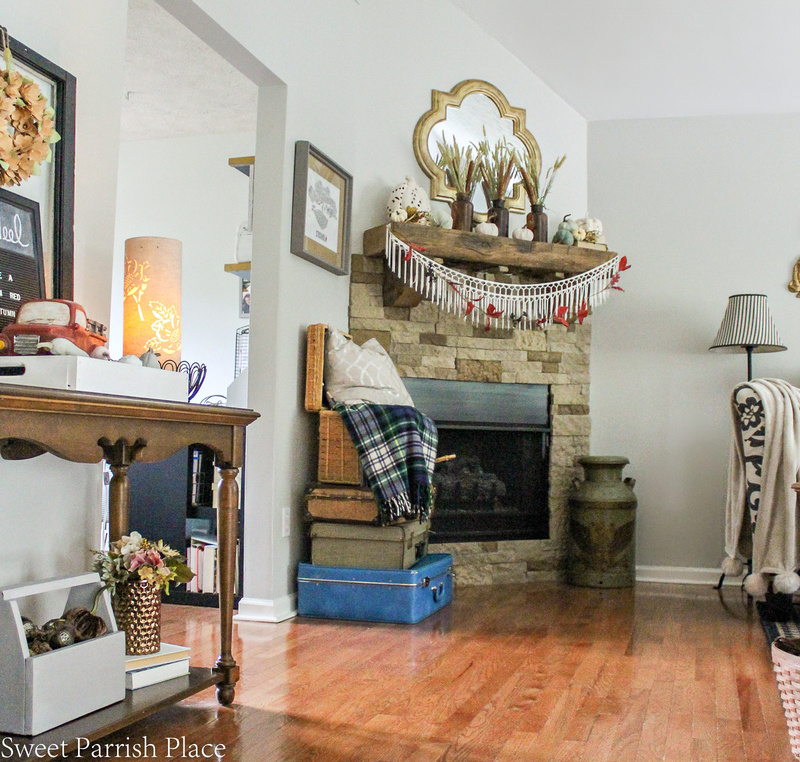 I tried to simplify my fall decor a little more this year, and have found myself leaning more and more toward keeping things simple when it comes to decorating for the seasons. Although I do love pumpkins, and lots of pumpkins, I must admit! I hope you enjoyed my fall mantle tour this year. I have a lot in store for the blog coming up. On Thursday I will be throwing in my hat for the fourth time into the One Room Challenge. And this year we will be giving our kitchen a makeover! On Thursday I will be revealing before pictures and sharing my plans for the renovation. I must say that this is going to be my best ORC room so far, and I cannot wait to share it all with you! So for 6 weeks, you can look forward to following along with my kitchen renovation. Or at least I hope you will! Have a great day friends! I know this is off base and I do apologize for it…however, what kind of floors do you have. IE. real wood, pergo, etc. I love the color and look of them. I am going to put wood ( not real wood) and because I have 4 dogs who like to leave their DNA on the rugs, I have been looking. If you could be kind as to tell me the color and the name of the product I would much appreciated it. Hi Rosie! I wish I could answer that question for you, but the floors were here when we bought the home. I do know they are hardwood floors, and I believe they are oak, but I am not 100% positive. the type of flooring we have is very common in the area where we live, I see it a lot. I wish I could help you more!